Pretty Things: 7000 Bracelets of Hope Blog Hop -- and a giveaway! 7000 Bracelets of Hope Blog Hop -- and a giveaway! This is my second year participating in the 7000 Bracelets of Hope through the Global Genes project. The purpose is to create a blue bracelet to send to a family who has a child suffering from a rare disease, disorder, or condition. Why blue? Genes, jeans, get it? If you would like to send a bracelet, click here for the information! A while back, the Czechoslovakian company Preciosa Ornela contacted me to see if I'd like to review their beads. I LOVE Czech glass! The company sent me a hugely generous package of beads -- two "bead soup" packages of pressed glass and glass pearls and a LOT of seed beads, including their unique two-hole seed beads called PRECIOSA Twin. The beads have a gorgeous luster, whether they're matte, opaque, or translucent. I'll have a design made with some of the Preciosa Twin beads soon! You can find Preciosa Orenela at Facebook, Twitter, or their web site. They have LOTS of tutorials for you, too! To one person, a huge portion of red Preciosa pressed glass beads. 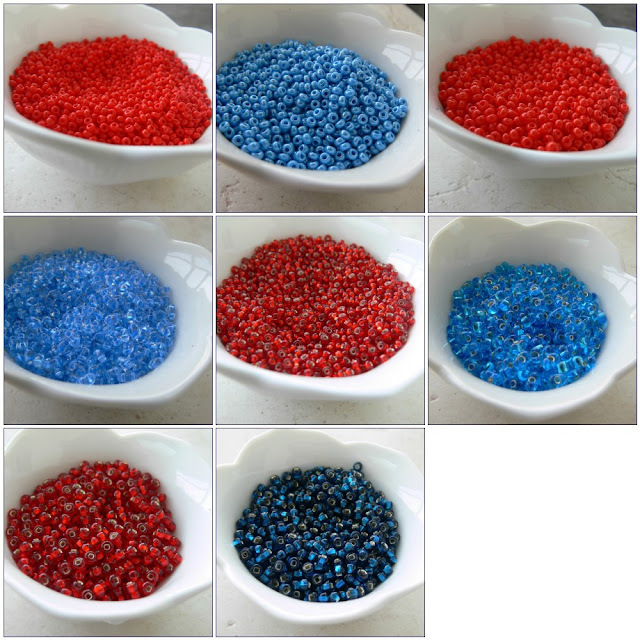 To another person, a large assortment of various sizes of seed beads. The giveaway sign ups are now over -- thanks for playing and stay tuned for more giveaways! Hot dog I love giveaways and Czech glass!! I love love love their color mixes and picasso finishes! I would prefer the soup mix but whatever is good with me! The bracelet is beautiful too! Just perfect shades of blue for 7000 Bracelets! I FB'd this post as well! Lori, I love your blue bracelet. Thanks for being a part of this most worthwhile blog hop. I love both assortments of the Czech glass, but I think I would really LOVE to win the red assortment! I love a giveaway too. I would prefer seed beads, please. I will blog, facebook and tweet about this in the morning. I too got too anxious about the giveaway. The bracelet is lovely and the blue is so calming. I know its recipient will love it. What a wonderful, happy bracelet, Lori! You always come up with such clever designs! 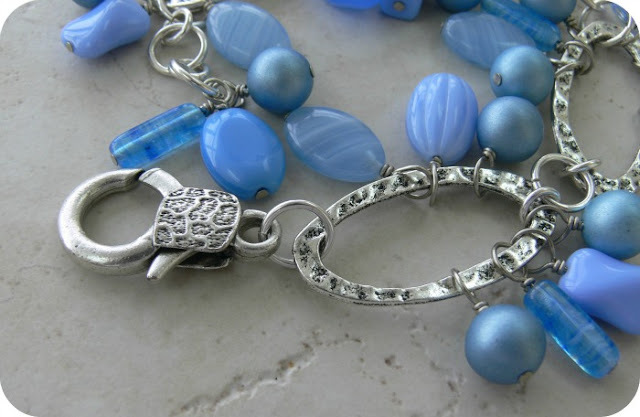 Your bracelet is very pretty with all the blue dangles and don't you just love the way silver makes blue pop! I enjoy working with Czech glass beads whether I'm stringing or sewing beads. If I'm one of the lucky winners I would prefer the seed beads, thank you. Love the bracelet, Lori, just perfect for the occasion. Wow Lori a great bracelet and a giveaway your to sweet. I really like those twin beads I will have to look them up. As for the giveaway.. hmm.. tough choice.. they're all so yummy...but I guess I'll toss my vote to the pressed glass. I like the design of your blue jeans/genes bracelet - that type of soft blue's can be rather a "quiet" colour esp without other colours to zing it up, so I think the large oval links work really well to add interest to the design. I would love a little more bead soup! Yoursef bracelet turned out really cute, love that textured clasp Lori. Way to put some more good karma into the world. I love the bracelet you made. The links and the decorated clasp are beautiful. And I love the blue dangles which are sweet and cheerful. If I won I would choose the seed beads. Thanks for the chance to win! I love your bracelet with the cool denim blue dangles. The recipient will love it! Thanks for the opportunity to win. I would love to have the beautiful red beads. I use red in a lot of designs. very pretty bracelet Lori -gorgeous shades of blue and it looks like it will be great fun to wear. I'm sure the recipient will be 'chuffed to bits' as we brits say. Just blogged about your Blog Hop and Giveway. Off to see the other bracelets now. Nice bracelet, I just tweeted about you giveaway! Hi I just tweeted about the giveaway! Nice bracelet also! I really like the base chain- perfect for the beads. Love Fringe!!! This is a great bracelet-great feel and swing :-) I would love for this to be an annual event...such a great feeling making something for someone else, especially when they don't know it is coming :-) Thank you for last year's and thank you for hopping this year! As for the giveaway if I win either would be fine with me! Thank you! I am diggin' your bracelet big time Lori! 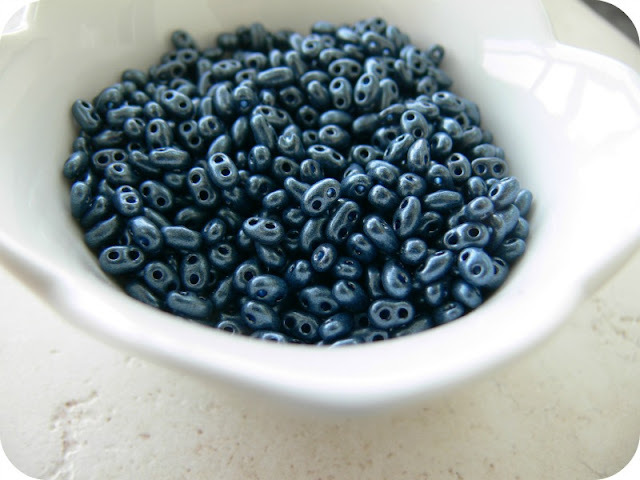 I love the color of the beads - just the perfect blue for certain!! And, of course, I love the links and the silver! I know whoever gets this bracelets will fall in love w/it! Also, that's a cool give-a-way you're having - I'd go for the bead soup mix because even though I have a ton of seed beads, I have no idea what to do w/them or how to use them! LOL!! That lobster clasp is way cool and I love those big silver links! Beautiful bracelet! Great blues, I love the boldness and the big chain links! I think I will join the 7000 Bracelets, my daughter adopted 2 children from China who have a rare disease. I would prefer the bead soup mix, don't use seed beads much. What lovely bracelets - from you and the other participants. What a great way to be involved. I too love Czech glass - always attracted to it at bead shows more than anything else. I would love the red mix and can see the possibilities with your one photo. Have a good weekend. Your bracelet is lovely as are those made by the other participants. What a nice thing to take part in and a nice giveaway to boot. I love Czech glass - I'm always attracted to it at bead shows more than anything else. The red glass assortment is quite pretty, and I can see the possibilities with your one photo. Have a good weekend. I love your bracelet design and colors! I just love the bracelet you created- those links are so cool, and the clusters of dangles are fabulous ( I love a jingling dangle bracelet too!). Wonderful work, Lori, and I know that the recipient will feel loved when she wears this. Thank you so very much for joining us on this hop! Those are beautiful shades of blue in that bracelet, and I love the design, as well! Thanks for the beady giveaway opportunity! I would be grateful to receive either mix! I aslo posted your blogspot on Facebook! What a wonderful bracelet! I'm sure who ever receives it will love it! Thanks for the great giveaway! I have been working with a lot of seed beads lately, it would be nice to try something different. I would love to create different pieces eith the pressed glass. Lori, you are so generous. I would be delighted with either. What a great giveaway! I would prefer the bead soup. Great for making a bracelet. Well you glorious girl of the hugest heart ever, I love your bracelet- that is a great lobster clasp!! I adore the dangles!! I would love the soup if it ever comes to that!! I do hope that you are feeling better!!! Lori, I know it's a hassle to adopt if you have any medical issues. Sharon has been pretty lucky, 2 from China and 1 from Ethiopia, and one from here in Maine. Only the 2 from China have a problem, and to look at them you would never know it. At least you have Zach. Ps I saw your article on Rita's blog, what did you wish you had known before doing a show. It was good. Wow- a give away for us too? You are amazing. Thank you! Love that bracelet Lori, beautiful, who ever receives it is going to adore wearing it. I would love to be entered into the giveaway, and if I were lucky enough to win then I would be sure to give those seed beads a good home!! Thnks for the chance! Your bracelet design is just fabulous. Love how the cool metallic silver makes the satin finish of the beads pop. And that closure - just perfect! How I would love to be the recipient of those seed beads. Lori, your bracelet is beautiful. 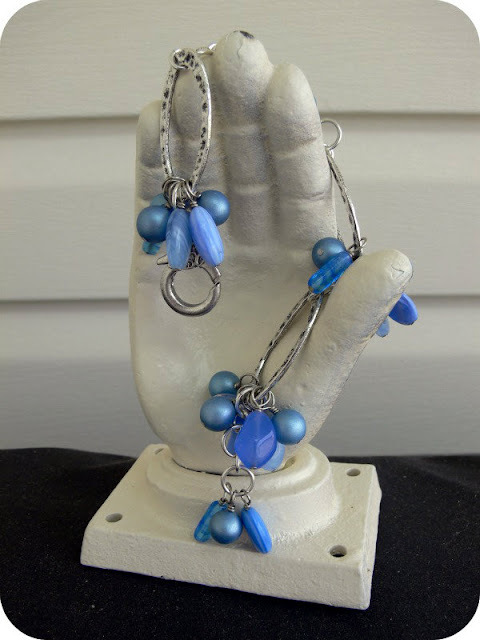 I love the links that you used and the color of blue is refreshing with the silver. I love your bracelet. The large chain really will make sure those dangles move around on the wrist. And, that decorative lobster clasp is so very cool. I haven't seen too many decorative ones before, just plain old boring ones mostly. I'll have to keep my eyes peeled for more 'fun' ones! There's no doubt in my mind that the lady who gets to wear your bracelets will be head over heels for it! As far as your giveaway. . .I prefer the red bead soup mix. I'm just not a seed beader, but that read and blue together is really beautiful! Beautiful! Love the silver and blue combination. Lori, your bracelet is beautiful! I love a bracelet that has movement and the color of the czech glass is the perfect shade of blue! Beautifully done! Lori, I wish I had your clasp on my bracelet! What a beautiful clasp to go with those oval links! What an awesome lady you are for the giveaways! You know I'm a seed bead girl, but I'd be happy with any of that wonderful beadiness! Oh my goodness! I absolutely love this blue with the silver on your bracelet! Gorgeous, Lori. Oh what a lovely bracelet Lori! You and I share the same love of "noisy" bracelets. I can almost hear the joyful jingle jangle this beauty will bring! Regarding the awesome giveaway, winning either set of beads would be a delight! Oh, I would love to win those twin seed beads! I can't wait to try them. Thanks! I'd love to have the Bead soup. The beads all look wonderful, and the twin seed beads are great. I really like the bracelet you made for this. The decorative lobster clasp is cute and adds to the design. I just tweeted about your giveaway and your Bracelets of Hope blog hop. love the bracelet you made. After having a client loose her fav bracelet I only use a lobster claw and I love that one. Luv the Bracelet! Fun & happy! They'll luv it too! First of all I love your bracelet Lori. The blue beads are stunning and the dangles are awesome. Second.....you know I just love your giveaways and with that said I would love to win the bead soup mix. Off to tweet and tell everyone on FB, Plus finish my blog hopping. I hope you got a chance to check out my contribution to the 7000. What a beautiful bracelet, Lori, for such a great cause. I love that shade of blue you used for the dangles! Lovely Bracelet for a great cause! And seed bead fanatic that I am, I would love to win! I have not had a chance to work with Czech glass and would LOVE an opportunity. PLEASE add my name to the bead bowl. Sharing on Facebook (liked their page too) and I would be happy with either, but think I would prefer to start with the soup mix. I have a bead related blog post up now, including a reminder about the Bead Soup party reveal, and I will edit and add this giveaway. Lori, I so love your style - I can always tell when you've designed something! this is a stunning bracelet, full of movement and fun. Someone is going to be very happy wearing this! Love the bracelet! It is gorgeous!! 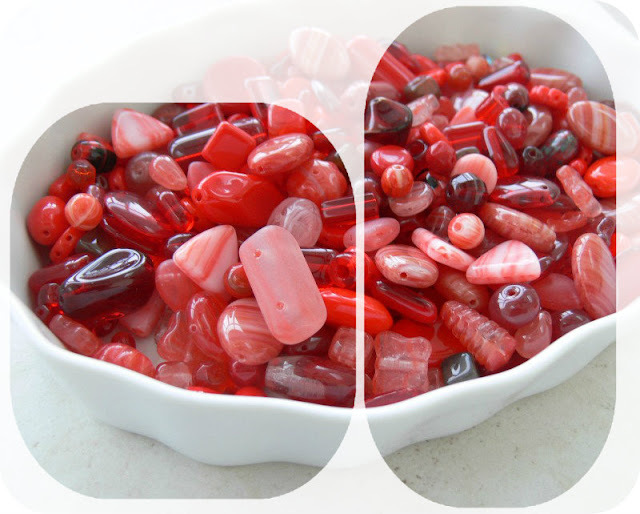 Love the bead soup mix, starting to notice I like red, and do not have many beads in that color! great give aways! would love to win either one! The bracelet is beautiful and unique - lucky the person who receives it! And of course who would turn down the opportunity for bead soup? I would love to win! Love your bracelet too Lori! You are so blessed with talent. I just found your page. Your work is amazing. I have no blog, but need one. I am a bracelet maker. My email is palijewels@ymail.com. I love your blue bracelet. I prefer seed beads. Wow! I'd like either as I'm starting to get obsessed with kumihimo. :). Thanks for thinking of us! p.s. I like the red bead set. And those beads are very pretty too! OOH YUM those red pressed glass ones are yummy! Love your bracelet, Lori. Your things are always so cheerful. Would like the pressed glass mix. Off to blog about the giveaway. Thnaks for having it. I love the colour of your bracelet and so I prefer the seed beads.